Born: Oakland, CA; Studied: Ling Nan School (Hong Kong); Member; National Academy of Design, American Watercolor Society, California Water Color Society. Dong Kingman was born in California of Chinese parents. While still a child, he returned with them to China. There, Kingman received art instruction from traditional Chinese watercolorists and Size-To-Wai, a Paris-educated artist who was very knowledgeable about modern art trends. In 1929, Kingman moved back to San Francisco and started producing watercolor paintings depicting Bay Area cityscape subjects. During the Depression, Kingman did watercolors for the P.W.A. Art Relief project in San Francisco and his works were included in the Frontiers of American Art show. By the mid-1930s, when California watercolors were beginning to receive national attention, Kingman was recognized as one of the Bay Area’s finest watercolorists. The San Francisco Museum of Art acquired a number of his works and exhibited them in numerous watercolor shows. In 1942, he was awarded a Guggenheim Fellowship which enabled him to travel around the United States painting watercolors of American scene subjects. When Kingman got to New York City, he found it to his liking and produced a number of works depicting cityscape subjects. He went into the service during World War II and ended up producing art for the war effort in Washington, D.C. After the war, he decided to live in New York City and spend less time in San Francisco. Kingman’s early works featured loose washes, often done using a wet-into-wet technique, with some dry brush calligraphy for definition. His post war works became increasingly complex in subject matter and usually had a geometric, abstractionist look. 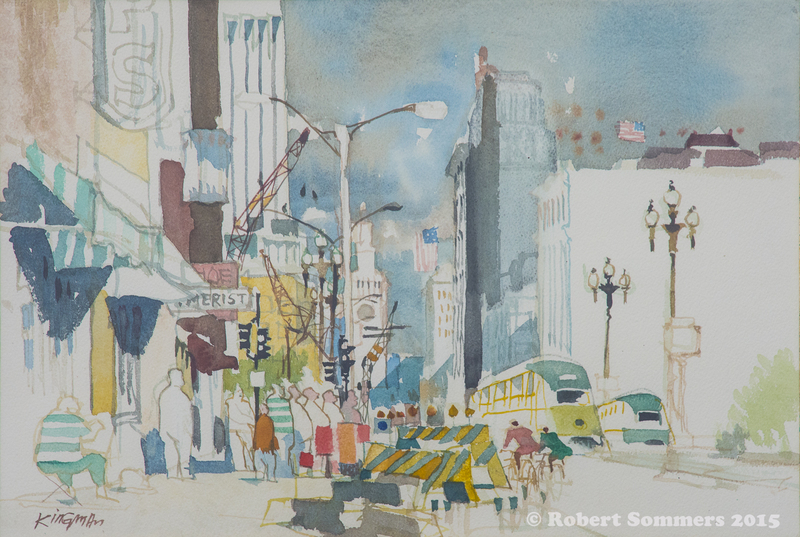 Between 1945 and 1965, he painted a large number of outstanding cityscape watercolors of New York City and San Francisco. The best of these woks have exceptional compositions, interesting subject matter and an exciting sense of drama. They are among the finest examples of American watercolor produced during this era. In addition to painting and exhibiting fine art, his works have been reproduced as covers for Fortune and as article illustrations inside the magazine. Life, Time, Westways and numerous other magazines also reproduced his works. As an art instructor, he has taught at the Rhode Island School of Design, Columbia University, Hunter College, Famous Artists School, and has been the featured teacher at dozens of significant watercolor workshops throughout the world. Kingman’s watercolors are in major museums throughout America and the Orient. There have been three books written about his life and work, and a film documenting his approach to watercolor painting was released in 1954. Interview with Dong Kingman, 1994. The Watercolors of Dong Kingman.